Why Won’t “Progressive” US Presidential Candidate Bernie Sanders Talk About War? If your local city or town government spent 54% of its funds on an immoral, disastrous, and unpopular project, and your brave, populist, socialist candidate for mayor virtually never acknowledged its existence, would you think something was wrong? Would his admirable positions on numerous smaller projects, and on sources of revenue, ring a little hollow? Bernie Sanders was asked a while back about the military budget and was essentially accused of wanting to cut it by 50%. Oh no, he replied, I wouldn’t do that. He ought to have replied that doing that would leave the United States far and away the world’s biggest military spender, and that doing that would take U.S. military spending back to roughly 2001 levels. He ought to have mentioned that the savings of hundreds of billions of dollars could transform the United States and the world for the better, that tens of billions could end starvation and provide clean water worldwide, and end poverty at home, and fund projects like free college, and invest in green energy beyond the wildest dreams of its advocates. He ought to have quoted Eisenhower and pointed out the record of the past 14 years of military spending generating wars rather than preventing them. In other words, he ought to have given the sort of smart response he gives to the questions he’s usually asked on the topics he prefers to deal with. But this was militarism, and militarism is different. Sanders’ record is better than that of most presidential candidates, but very mixed. He’s gotten into shouting matches with his constituents over his support for Israeli wars fought with billions of dollars of free U.S. weapons. He’s supported incredibly wasteful military spending in his state. He opposes some wars, backs others, and glorifies militarism and the “service” that veterans have supposedly provided. While the public would like to fund useful projects and tax cuts for working people by both taxing the rich and slashing the military, Sanders only ever mentions taxing the rich. If he doesn’t want to cut the largest item in the budget by 50%, how much does he want to cut it by? Or does he want to increase it? Who knows. His speeches — at least most of them — and certainly his campaign website, never acknowledge that wars and militarism exist at all. When people have pressed him during Q&A sections of events, he’s proposed auditing the Department of so-called Defense. But what about cutting it? He’s proposed addressing veteran suicides. What about creating no more veterans? 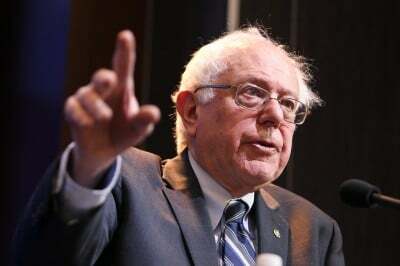 At RootsAction.org we’ve just launched a petition urging Sanders to speak on war and militarism. Thousands have already signed it here. The vote on the Iran deal could come down to 13 Democratic senators, and I haven’t heard Sanders whipping his colleagues at all. His eloquence and energy are needed now. Having voted the right way will not look like enough when another war has started.